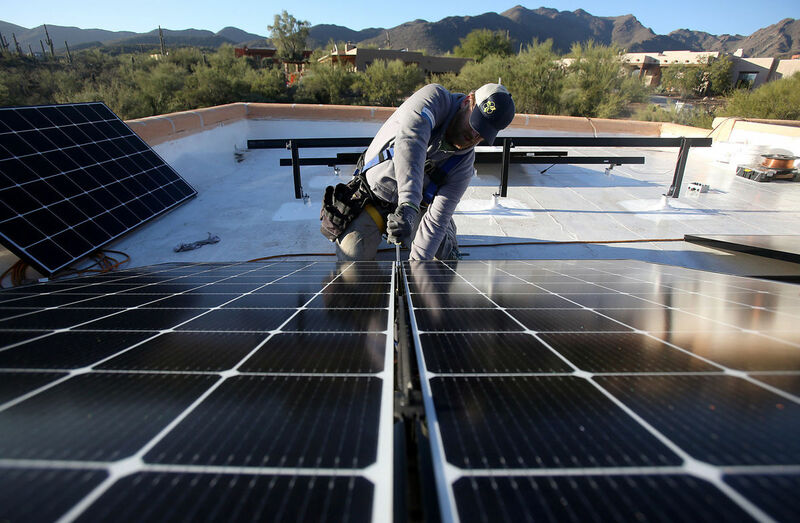 The Arizona Corporation Commission is being urged to amend its recent decision to end retail net metering for customers with rooftop solar, to correct the timing of when customers will be grandfathered under the old rules. The commission voted in late December to scrap the current system of net metering, by which customers with rooftop solar systems are reimbursed for their excess generation at each utility’s retail energy rate. To replace net metering, the utility panel approved a policy in which solar customers will be paid a new “export rate,” based on a proxy rate for power from utility-scale solar farms or on cost studies for each utility. The solar export rates — expected to be a fraction of retail rates — will eventually be set as part of proceedings in pending rate cases filed by utilities including Tucson Electric Power Co. and Arizona Public Service Co. But a few days after the commission’s vote, Arizona Public Service Co. filed documents urging the commission to amend its decision. APS noted that under an omnibus amendment passed after two full days of debate, the final order grandfathers under the current net-metering rules only customers whose systems are interconnected with their utility when the new rates go into effect. Grandfathered customers will keep their net metering rates for 20 years from the time their systems were turned on. But APS said it believes the grandfathering period was intended to extend to customers who submit an interconnection application by the effective date of the decision issued in their utility’s rate case, not when they are actually interconnected, which could occur weeks later. “Otherwise, whether a customer is grandfathered could be determined not by when a customer makes a decision to submit an application to interconnect, but instead by the volume of (rooftop solar) applications received, among other factors outside a customer’s control,” APS said. Since APS filed its request to correct the decision, parties including TEP, the state Residential Utility Consumer Office, the Vote Solar Coalition, the Alliance for Solar Choice and the Arizona Solar Energy Industries Association have filed documents in support of the change. In a filing on Wednesday, the administrative law judge in the solar case agreed with change urged by APS and the other parties and asked the Corporation Commission to take up the issue at its next open meeting Jan. 10-11. UPDATED: The judge's recommended amendment on grandfathering is on the Corporation Commission agenda for Jan. 10-11.